Look closely at some old furniture in your home or workplace and you may see the words ‘European labour only’ stamped on it. You may think you have a finely crafted piece of furniture made in Germany or France. But don’t rush to the antique dealer too quickly. 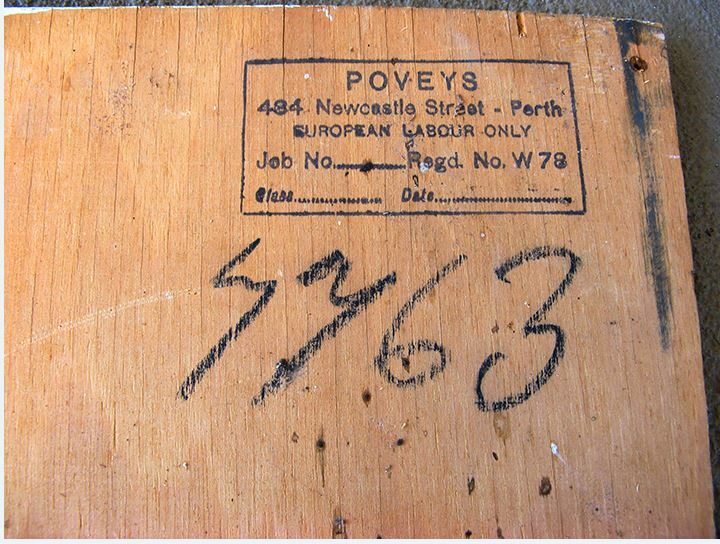 These stamps were common on furniture made in Australia before the 1960s. The ‘European labour only’ stamp was a legal requirement in Victoria, and in most other states. In Victoria it was set out in the Factories and Shops Act of 1896. It was later incorporated in different Acts over time under various names, finally remaining in 1958 as part of the Labour and Industry Act. 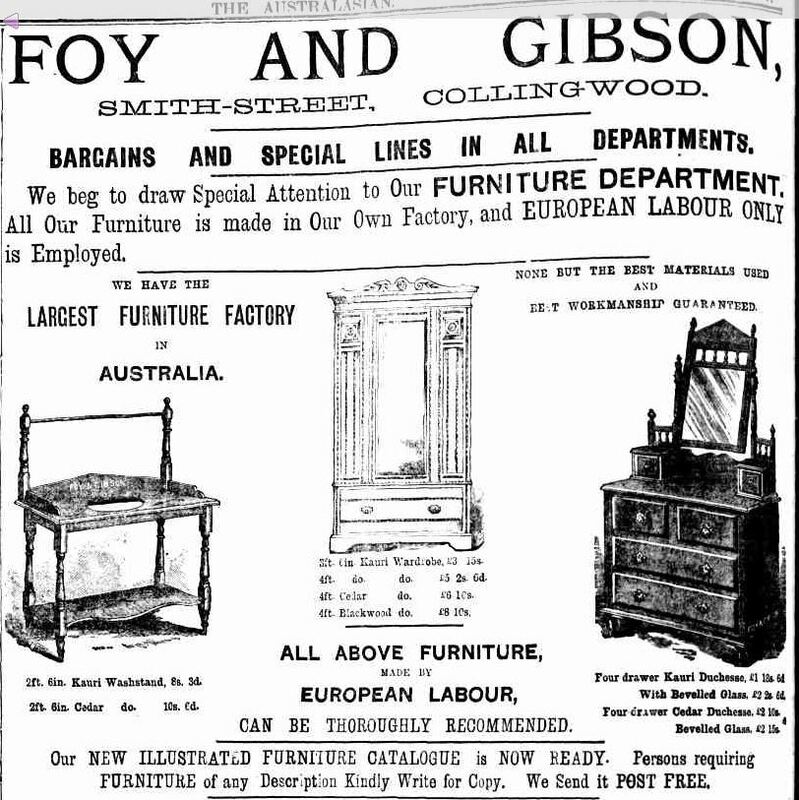 The purpose of the legislation was to distinguish between furniture made in Victoria by Chinese workers and that made by Europeans, meaning Australians of European origin. indicating ‘European Labour’ made furniture. In the 1880s there was great concern about what was known as ‘sweated labour’ or ‘sweating’. This was the use of labour in highly exploitative conditions. It usually meant workers subjected to very long hours, unsafe conditions, low pay and insecure employment. 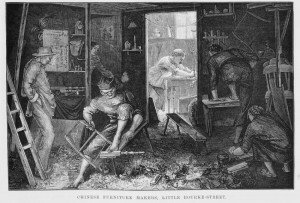 The Chinese community were often accused of making use of ‘sweated labour’, especially in the manufacture of furniture. Unions accused the Chinese workers of unfairly undermining the conditions of European workers, while employers complained about unfair competition from Chinese owned businesses. Others said that the Chinese made furniture was of inferior quality. These views were contested by some at the time and later by historians such as Eric Rolls. Despite a lot of anti-Chinese sentiment it appears that many businesses were happy to sell Chinese made furniture, indeed some contemporary commentators felt it was ‘absolutely impossible to commence the retail furniture business without selling Chinese made furniture’. After a series of Parliamentary inquiries such as the inquiry into the Factories and Shops Act 1890 and ongoing agitation from unions, employers and lobby groups, stamping legislation was introduced in 1896. 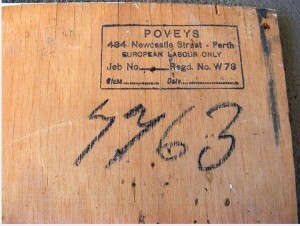 Furniture had to be stamped as ‘Chinese labour’ or ‘European labour only’, or ‘European and other labour’ if a combination of labour sources was used. The stamping legislation, and other measures such as greater regulation of working hours did harm the viability of the Chinese furniture makers. Over a period of time their presence in the industry declined and eventually, virtually disappeared. The problem of sweated labour was very real and attempts to reduce it were well-intentioned. But the Chinese and other non European communities did suffer from very prejudicial attitudes in this era. When Chinese workers were on strike against their employers for improved conditions in the 1880s and early 1890s they sought the support of the union movement but were rejected. There were even threats of using European labour against them as strike breakers. Later attempts by the Chinese to be involved in the industry reform and regulation were also rejected. The rejection of the Chinese workers pleas for solidarity by their Australian or European fellow workers was a missed opportunity. What could have become a bridge between different communities remained a wall that divided them. A legacy of prejudice and misconceptions remained for generations. In Victoria the stamping regulations were in force until 1963. The last remaining references to European and Chinese Labour stamping was removed from the Labour and Industry Act 1958, by various new provisions in the Labour and Industry Amendment Act of 1963. Wardrobe with European Labour Only stamp. Racist Furniture post, 18 April, 2011. Beaton, Lynn, Part of the furniture: Moments in the history of the Federated Furniture Trades Society of Victoria, Melbourne University Press: Carlton, Vic., 2007, pages 39-48. Rolls, Eric, Citizens : Flowers and the wide sea: continuing the epic story of China’s centuries-old relationship with Australia, University of Queensland Press: St. Lucia, Qld., 1996, pages 111-116. It’s good to see growing awareness of and interest in this kind of history! Thanks for the comment and link to article Lia. Tim Hogan, State Library of Victoria. I have 5 off these wood dining chairs .they were given to me to cut up for making toys out off. Should I cut them up or keep them. P.S i see your comment is rather old.Hope its not too late for those chairs !! Hi Lee, Thank you for your interest in our blog. We will look into it for you and send an answer to your email address. Hi, was hoping that someone may be able to give me some information regarding a Hall Stand/Cupboard Ive purchased. The manufacturer stamp is an inverted triangle “Tack Loong 7 Hayward Lane Melbourne, Maker Chinese Labour” Any info would be appreciated. Hello Zana, We will look into this for you and reply to your email address. Thank you for your interest. There’s a simple, white painted wooden kitchen chair at Cape Otway Lightstation. It was made by Foy & Gibson for the Commonwealth Lighthouse Service and probably dates between 1915 and the 1920s. The manufacturer’s stamp under the seat reads ‘European Labor Only. 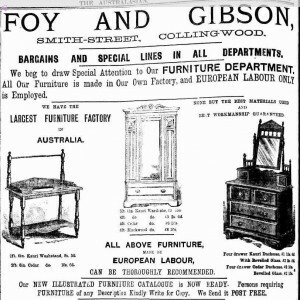 Made by Foy & Gibson Pty Ltd, Smith Street, Collingwood’. Helen, Am in the process of taking off that dreaded cream on top of green thick paint used on that lovely cream pine they made the lead-lighted kitchen cupboards out of , and found a stamp in the bottom of the drawer A3 EUROPEAN LABOUR ONLY. My grand daughter is one lucky girl having salvaged the init from a friend taking it to the dump Thanks all the info. I presume the A12 may stand for the manufacturer as there is no other info. Could you please assist, as i am trying to see how old the table and chairs may be. Thanks for your comment. We didn’t come across any information about manufacturer’s names or marks when writing this piece. So it may be a fairly obscure piece of information. We will have a look though and see if we can uncover anything. Hi I have some furniture dressing table & bedside cabinet, inside a draw is stamped H. Lum & Co Lit Bourke St Melbourne all European labour also has a four digit phone number. I assume that it is a Chinese company, it was purchased from a person called Tok, the previous Co owner. Have you any further info on H. Lum & Co? Hi Charlie, thanks for your comment. H. Lum & Co. operated a furniture store which was known as the Melba Furnishing Company. It is mentioned a couple of times in Melbourne newspapers in 1923 and in 1930, when there were fires at the premises, or near by. So your piece of furniture may date from around that time. You can search for more newspaper references online on Trove, a website containing digitised Australian newspapers from the 19th and 20th centuries, http://trove.nla.gov.au. There are other sources you can check like old postal and commercial directories, known commonly as the Sands and Macdougall’s Directories. These are a bit like the Yellow Pages of today. Unfortunately they are not freely available online. They are held by all State Libraries, and in some of the larger public libraries around Melbourne, and other cities and towns. You should be able to track the existence of the Melba Furnishing Company, owned by H Lum by looking at these. Can you please advise me where to start in being able to find more information on this piece? Hi Trudi, thank you for your comments. Unfortunately the maker’s name, ‘JP’, is not much too go on, and we are not aware of a way to search for information purely by the serial number or design number. I would suggest trying the following sources, old postal and commercial directories, known commonly in Victoria as the Sands and Macdougall’s Directories, digitised newspapers on Trove, http://trove.nla.gov.au, and one of the standard reference works on Australian furniture, “Australian furniture : Pictorial history and dictionary, 1788 – 1938” by Kevin Fahy, Andrew Simpson, published in 1998. All of these sources are available at larger research libraries in all states of Australia. Hullo I have recently purchased a pedestal/plinth which may have held a pot plant or small sculpture. It is oak and I estimate 1920-1930 and in very good order. The stamped underside reads: J G Guest Furniture Manufacturers Richmond (I presume Richmond Victoria) and also has the European Labour Only stamp. I have other old pieces from that period and was very interested to read the information and comments regarding “European Labour Only”. Pounds saved on finest furniture direct from the factory : out of the high rent area. J.G. Guest and Co. .
Trove, a website containing digitised Australian newspapers from the 19th and 20th centuries, http://trove.nla.gov.au can be used to find further mentions of J.G Guest & Company which appears to have existed into the 1940s and 1950s. We have just obtained a lovely old 1920’s-30’s Art Deco Buffet/ drinks cabinet.. Unfortunately I cannot find any info on the manufacturer, I am wanting to restore it to it’s original beauty but am unable to find any pictures to match stain etc, hoping you may be able to shed some light? I have a beautiful old sideboard made by “Standis Furniture” stamped “European labour only”. I cant find any information about it except Standis started production from 1912. Is there some clues on how I can find its age? Allan I have just been given an old buffet marked Standis Furniture, it has a curved top backboard, three drawers in the middle with a glass inset door either side, cabriole legs. Have you found any info on your piece. This chair has been in the family since my great grandparents. Having read the story of why this is stamped on the chair would like to know anyway of finding out what A 9 may mean and year may have been made approximately? We have been asked about this A9 code previously. See the reply I made to Trudi above on 3 January 2017 where she asked the same question. Unfortunately we were unable to find out what the A9, or other similar codes might have meant. Perhaps someone in the furniture trade might know? The stamps were used over many decades as the Blog piece indicates from the 1890s to the 1960s, so the furniture could date from anywhere in that time. An antique furniture dealer could possibly make a more accurate estimate of the date. Hi, hoping you can help I have what I think is a hall cupboard with L Coulton Northcote European Labour Only, is there any way to find out how old it is as I was going to give it away for free until I saw this written on it. Any info would be appreciated. I will take your question as deferred enquriy and a librarian will get back to you. Hi,my son and daughter in law have a beatutifull ART DECO gentlemans cupboard with the stamp European Labour. Hi, I have a delightful dresser that I would love to know a bit more about. Sadly some of the stamp either didn’t get pressed down hard enough or was worn off. It’s from NSW so even if you could put me on to someone there I would be great full. I do not believe the missing part of the stamp says either European or Chinese Labor so feel it maybe a later Déco inspired piece. 071260 is on a separate stamp. Thanks for your question. A librarian will get back to you soon. I’m currently restoring a large kitchen dresser made by the Melbourne Chair Company in 1919 – stamp underneath a drawer had the date and The ‘European Labour only.’ Have wondered about this terminology as I have it on other pieces I have restored. Gotta love the local tip shop! I have often seen these stamps, and I had presumed that they were originated for purely racist reasons. It’s interesting to learn that there was also an economic / labour struggle side to these stamps. If I’d thought about it more, I would’ve tweaked to this. Brexit would not have happened if the UK had had better employment laws. I am trying to date/ find out more information on a wooden wardrobe and a matching dressing table stamped Scotchmer Furniture Factory. They both also have stickers stating that the manufacturer complies with the requirements of ‘Australian Furniture Standard no. S.1.’. I was hoping to find an archive of old factories to find out more information or any other resources. 2) Figure out how long Australian Furniture Standard no. S.1 (marked on the furniture) was in operation. To do 1), check Trove, a website containing digitised Australian newspapers from the 19th and 20th centuries, http://trove.nla.gov.au. The newspapers may include ads or other mentions of the company. Most newspapers on this website date before 1955. You can also access all the directories for 1865-1880, digitised by the University of Melbourne, at https://omeka.cloud.unimelb.edu.au/melbourne-history/exhibits/show/melbournedirectories/browsemelbournedirectories Microfiche copies of the directories are also held by all State Libraries, and in some of the larger public libraries around Melbourne, and other cities and towns. You should be able to track the existence of the Melba Furnishing Company by looking at these directories. It would also be worth checking one of the standard reference works on Australian furniture, “Australian furniture: pictorial history and dictionary, 1788 – 1938” by Kevin Fahy, Andrew Simpson, published in 1998. It is available at larger research libraries in all states of Australia. I came across the site while trying to decipher a stamp on the inside of a draw belonging to a large bedside cabinet. The stamp is smudged, but the last word is clearly “Ward” on the top line, the next line seems to say “Furniture Manufacturer”, then below a blurred address ending in “Melbourne’, and underneath is “European Labour Only”. The word in front of “Ward” may start with “W”, and I have imagined that it might be “William”, but it’s really too smudged to be sure of anything. My Internet searching has gone nowhere. I am aware of Fred Ward, but most of the furniture I see is mid-century or post-war. This item looks to be early 1930s to me, or maybe 1920s (?). It’s made of Queensland Maple and has Queen Anne legs, a drawer on top and a cupboard below. Sides are maple-faced ply as is the centre of the cupboard door. The piece is bow-fronted, with a curved drawer. The timber is the thickest I’ve seen on a drawer. Very unusual. I’m a Queenslander and mainly restore Brisbane-made furniture, so I’m a bit at a loss here. Any guidance would be greatly appreciated! BTW, I’ve never seen an item marked “Chinese labour”. Hopefully I’ll find one in the future. I found references on Trove to a furniture manufacture, William Ward, who died in 1932. He had a business in the city. Wow! Thanks so much Tim. That must be it. So it looks like my reading of “William” was correct. The terminus ante quem of 1932 makes sense to me. I reckon my item is 1920s or very early 1930s. Actually starting to think more later 1920s. No worries Michael, glad that helped. D.Drain Furniture Manufacturer 121 Lygon Street, East Brunswick European Labour Only. Interested in the history so any info will be gratefully received. We will look into this for you and reply to your email address. Thank you for your interest. I would appreciate more information if available. Thank you. I recently found a gorgeous Queen Anne type dresser on the side of the road. I sanded it back and found a label saying “Manufactured by H Lum & Co. 136-138 Lit. Bourke street Melbourne. Do you have any idea of when this company stopped making furniture? I’d really like to know how old it is. Thank you! Hi, thanks for your comments. We will have look and see if we can find out for you. Hi I have a glass front and side display cabinet with 2 drawers at the bottom that I’m trying to find out more about. It has a stamp inside one of the drawers. Thanks for your enquiry Belinda. I will pass it onto our Ask A Libraian service and a staff member will get back to you.